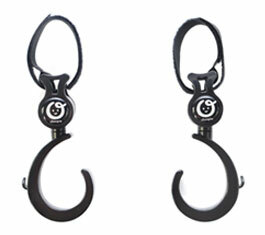 My kids are past the stroller stage, but I would’ve killed to have these hooks when I was pushing a stroller around town. They velcro onto your stroller, car seat, crib, wherever you need an extra hand (and let’s face it, what mom (or dad) doesn’t need an extra hand?) And because there’s no clip, you can easily slip bags on and off of the hook. Since I don’t need them for extra baggage on a stroller, I have found other handy ways to use the cityhook. Since winter hit, our car floor has been covered in slush and salt from our messy boots. So, whenever we get in the car, the bottoms of my purse and my kids’ backpacks get wet and covered with muck. We fastened one of these to the head rest of the front seat and, voilà! A hook for purses and backpacks…and no more messy bottoms! On top of being very useful, they are moderately priced and they come in pairs. You can get them from choopie.com. Disclaimer: I was provided with a pair of cityhooks for review (but they have come in very handy and I love them!) I received no other compensation and the opinions above are entirely my own. This entry was posted in Uncategorized and tagged convenience, family, kids, mommy product, parenthood, parenting, Reviews & plugs on February 15, 2014 by Nancy. Strollers and such have come a long way since I had my children. Our biggest complaint, the strollers were always too short for my tall husband.